I recently completed a 900-mile move from Atlanta to Philadelphia. It was long, and arduous, and difficult, and I spent a large portion of it wishing I could claw my eyes out with a flathead screwdriver. Here I'm referring to the part of the move where I had to deal with Comcast. The rest of the move wasn't quite so bad. You'd know this if you followed me on Twitter, because I posted several highly exciting eyewitness photos from the open road. There was, for example, the group of exotic cars that had been stopped by police just outside of Atlanta, presumably for racing. And the Audi RS6 in central Virginia with the coolest vanity plate of all time. But what I didn't cover on social media is possibly the most exciting automotive part of the entire trip: what it's like to drive across the country in a fully-loaded 17-foot U-Haul with windshield wipers older than a second-grader. So I'm going to do that now. To begin, I should say that my U-Haul really was fully loaded, top to bottom, front to back, to the point where I had to push things into place as I shut the door, knowing that someday, if I ever made it to Philadelphia, it would immediately fall on my face. This is because I didn't pack the U-Haul myself. If I had packed the U-Haul myself, there would've been two U-Hauls, one marked "PILLOWS" and the other marked "BROKEN STUFF." Instead, we hired two professional movers to pack it, and they utilized every square inch in the way that only two seasoned veterans of the moving industry can. So we sat back, got out of the way, let them do their thing, and watched as they used up every nook and cranny of the moving truck, perfectly packaging all my goods with impressive, skillful care, until the end of the afternoon when they told us it was their first week on the job. So anyway: when we set off for Philadelphia, the U-Haul was a little heavy. And this brings us to our first lesson in cross-country U-Haul transport, which is: fuel economy leaves a little something to be desired. And when I say "a little something to be desired," what I mean is that sometimes, as you glance down at the instrument panel, you'll notice that the fuel gauge is moving faster than the tachometer. Indeed, our 900-mile journey yielded us an overall average of around 8.2 miles per gallon, which is right up there, in terms of fuel efficiency, with pouring cans of gasoline directly down a storm drain. You know it's bad when you get passed by a Hummer H2, and you realize that, at this very moment, as you both drive down the very same road, he's doubling your fuel economy. Now, before I go any further, I should admit that some of our gas mileage issues may have related to my driving style. Since our stuff was so tightly packed in back, and thus there wasn't room for anything to roll around, I figured there was little chance something would break. So I did what any red-blooded American male would do: I pushed my foot down at every possible opportunity. It's at this point I must remind you that underneath its orange paint and troubling aerodynamics, the U-Haul is still a rear-wheel drive, V8-powered two-seater. No, I wasn't really that crazy with it. But I did decide, very early on, that I wasn't going to sacrifice travel speed for fuel economy. Yes, I know that some people hypermile these things and save a few bucks. But I realized that doing this would mean instead of arriving at 9 p.m., as planned, we would probably get in around 1 a.m., and I would fold myself out of the van, collapse on the lawn, and scream: "I DID IT! I GOT TEN MILES PER GALLON!" And then my neighbors would shoot me in the face, because this is Philadelphia. So what I did, instead, was I decided to drive at normal speeds that you might travel in a normal passenger car. In other words: in Georgia, 80 mph. In South Carolina, 80 mph. In North Carolina, 75 mph. And in Virginia, 37 mph in the right lane with my emergency flashers on so I didn't accidentally reach a speed where I would be arrested for felony speeding and placed in the same holding cell as a guy who set fire to an orphanage. And this brings me to a second lesson in cross-country U-Haul transport, which is: nobody likes getting passed by a U-Haul. When you're driving 80 mph in a normal car, and you pass someone, what happens is: NOTHING. Absolutely nothing. You pass them, they forget about it, and everyone moves on. This is a simple occurrence in our daily lives. Not so when you're in a U-Haul. It doesn't matter how fast you're going. You could be doing 85 miles per hour, passing someone going 50 miles per hour with their hazard lights on and farm plates and a chicken coop in the back. The second you get up to their driver's window, they realize: "OH MY GOD I'M GETTING PASSED BY A U-HAUL!!!" And then they absolutely floor the accelerator so this injustice doesn't carry itself out. "NOT TODAY!!!" they're probably screaming, as they dump chicken parts all over the road. If this had happened once, I would've dismissed it as an unusual occurrence. But it happened repeatedly; over, and over, and over again, with all sorts of different vehicles. One guy in a GMC Yukon, lazily driving along and texting when I passed him somewhere in central Virginia, sped up to more than 100 mph to re-assert his dominance once he realized what had happened. Fortunately, we eventually made it to Philadelphia, which brings me to our final U-Haul lesson of the day: you should not, under any circumstances, ever bring a 17-foot U-Haul into a city designed when the largest form of transportation was a Clydesdale. I'll set the scene for you: my girlfriend and I had spent months searching for a house in Philadelphia. We combed Craigslist, Zillow, Realtor.com – everything. We had friends looking for places. Finally, we picked one out, and looked at it on Street View every few days, eager to move in. We had a friend go through it and take photos of every room. We checked online menus for area restaurants. We planned out, in our minds, exactly what furniture would go in exactly what space. We were so excited. And then, when we finally arrived in our neighborhood, to the house we had been thinking about for months, the U-Haul was too big to fit down our street. So we've driven 900 miles, only to come to this: sitting at the end of our block, making a 10-point turn, trying to narrowly squeeze between a fire hydrant and a power pole, folding in the mirrors, blocking traffic in several directions, just fifty feet from our new front door. But eventually, somehow, we made it down our street, to our house, where a different set of movers helped us unload all our stuff. And eventually, somehow, we managed to return the U-Haul, after a harrowing drive through the center of Philadelphia in the middle of the day, dodging pedestrians, and cyclists, and delivery people, and city buses. 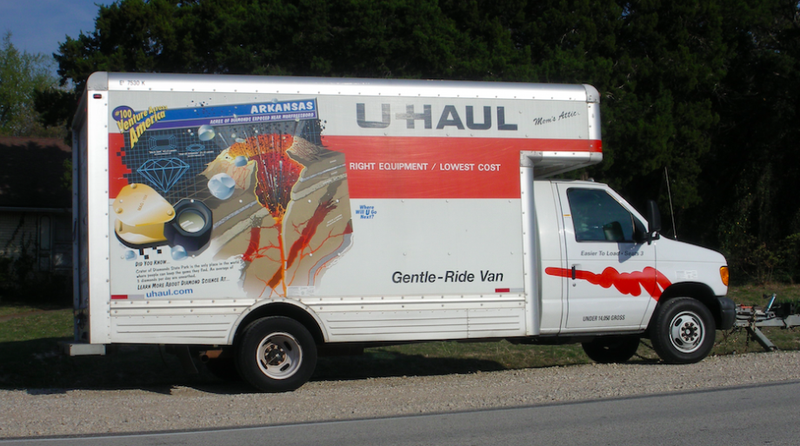 As we dropped off the truck, I noticed a sign painted on one of the panels that prominently featured U-Haul's slogan: "U-Haul: America's Moving Adventure." An adventure, indeed.